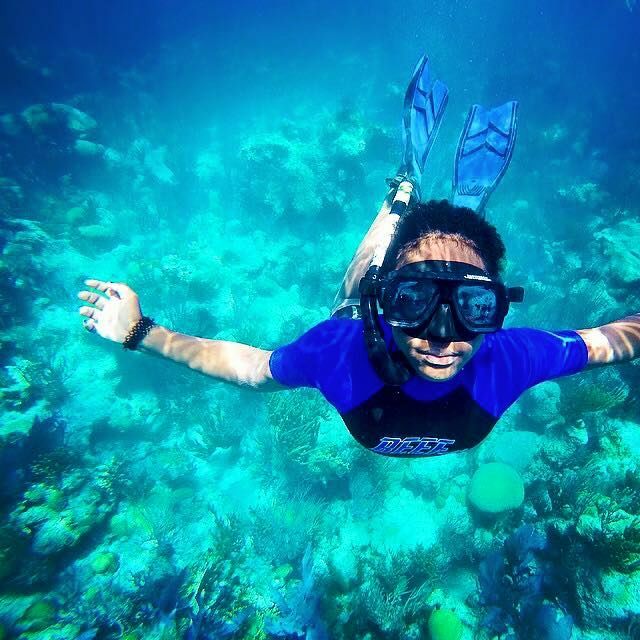 Thanks to a partnership between the Bermuda Zoological Society and the I Am Water Conservation Trust, which is sponsored by XL Catlin, Bermuda’s students are being exposed to our underwater frontiers through a unique programme called Kids on the Reef. 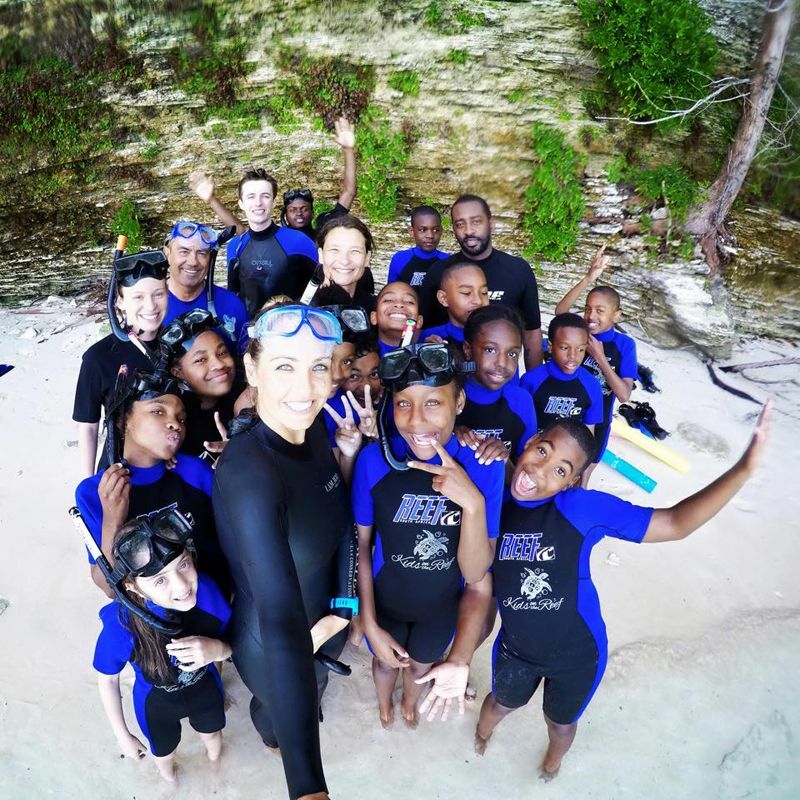 “Now in its third year, Kids on the Reef is all about taking kids outside their comfort zones, giving them the tools they need to be confident in the water, and to learn about Bermuda’s coral reefs,” explained programme coordinator and BZS educator Dr. Alex Amat. The two-day workshops are open to students from public middle schools and allow them the opportunity to experience the wonders of the deep out on Bermuda’s reefs. It includes both confined water and open-water freediving instruction, as well as classroom teaching, covering coral reef ecology, ocean conservation, and personal development. Through the use of yoga, students learn breath and body control so they can develop an awareness that will transfer itself into the water as they begin exploring – first the surface through snorkeling, and then in the mind-over-body challenge of freediving. I Am Water’s Education and Outreach Manager Beth Neale said, “It has been a great privilege for me to be a part of Kids on the Reef 2015! I Am Water believes that we need to give children the confidence to explore their beautiful blue backyard. It is only once they understand and appreciate how precious this resource is that they will want to protect it. I Am Water founder and freediving champion Hanli Prinsloo will be returning to teach the June sessions. In addition to the Kids on the Reef 2-day courses, the team has also offered two ocean freediving courses for adults, one in May, and the other scheduled for June 14th and 15st. In addition to obtaining a Level 1 Freediving certification, participants are asked to volunteer for two sessions at this year’s or next year’s Kids on the Reef programme. For information or to reserve a spot, contact Dr. Alex Amat at activities.bzs@gov.bm. Graham Pewter, on behalf of XL Catlin, said, “We are delighted to have been the sponsor of the Kids On The Reef since its inception in 2013. The programme allows kids to experience being on and beneath the ocean in deep water away from the beach and out of their comfort zone. “It expands their knowledge of the marine environment and will help them to gain an understanding of the importance of the health of reef to the island’s future”. Nice concept, but someone should’ve pressured Ross Perot before he blew up that reef. Come on Purvis!! Sign up for this too! Since half of the kids on island are in private school…can this be offered to private school at a small cost please. Um, according to Bermuda’s History, in 1870 an act was passed that property was sold and the moneys were used to establish two separate schools, one for white boys and one for black boys they were called Body One and Body Two. Body One established Saltus Grammer School and have been funded by taxpayers until 1972 when they became private, so have they and all the other private schools paid back the public money they received. Why do private school kids always have to pay extras? Not all students attending private school come from privileged families..SMH. Their parents make sacrificesle so that they can attend…. Parents who send their kids to private schools also pay for others to go to public schools, through taxes, without burdening the public school system. I have never understood why they always get ‘bashed’ for being lucky or privileged. Just saying.